After a night and day in Bangkok, we headed back to the airport for a quick flight up to Chiang Mai. We'd always heard wonderful things about the city in the northern, mountainous area of Thailand but had never been there ourselves. The kids' godparents were getting married at a small, family-run resort outside of town and we were able to get a great deal on a bungalow there. Normally we like to stay closer to activities and restaurants but the chance to be close to our friends and have a whole house for the kids won out. The grounds were park-like and the kids had a really good time exploring them. It was great to be able to let them have some freedom to roam and explore. See Earth climbing the stairs? That was his favorite thing to do. He would go down backwards, sit at the bottom and clap for himself, and then climb back up. We ended up having to block the gate to the stairs with the stroller because he'd find his way out there when we weren't on the porch and there wasn't anyone to watch him. This is the porch on our bungalow. There is a wall of doors on the left that go to the kitchen/living area and we would open all of them up and spend most of our time at home in this space. The parking lot was a hit with the boys. Jeeps! Motorcycles! As I said in my last post, the hardest thing for D and I on this trip was dealing with the kids' jet-lag. They're just not old enough to know to try to roll over and go back to sleep or to lay in bed with a book. If they're awake, they're up and going. To be honest, it used to make me really mad (I love my sleep!) but I've gotten a lot better at handling it. 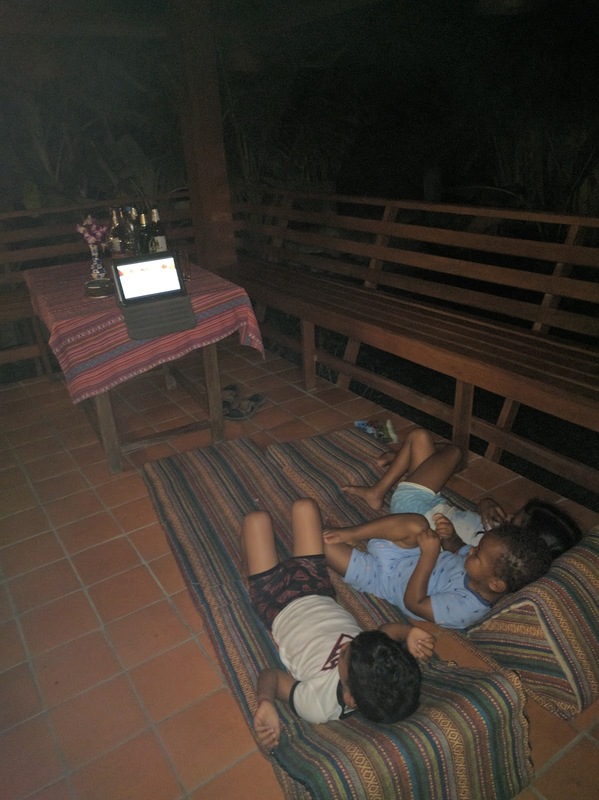 Thankfully, the resort had great wifi so we were able to stream TV shows for the kids when mornings started way too early. Wild Kratts counts as educational TV, right? Have you dealt with jet-lag and kids before? What worked for you, or didn't?